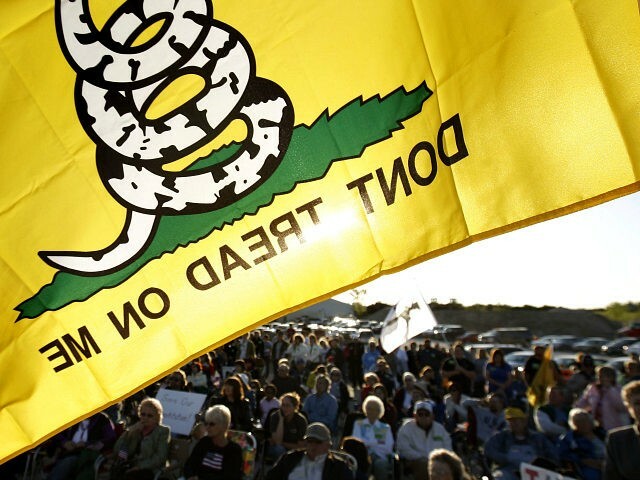 Tea Party groups across the country will rise again almost ten years after the first gatherings on tax day in 2010 this April 15. Tea Party Patriots Action is organizing “Stop Socialism, Choose Freedom” rallies this April 15. The group has released a video promoting the rallies stretching to the four corners of the continental United States. A map on the group’s website illustrates the massive scale of demonstrations. “10 Years ago socialism began to rise,” the video opens with the sound of then-President Barack Obama’s voice in the background. Video of Sen. Bernie Sanders giving a speech as part of what appears to be one of his 2016 presidential campaign speeches flashes across the screen before switching to a video of freshman New York congresswoman Alexandria Ocasio-Cortez. A clip of 2020 presidential candidate Elizabeth Warren in what appears to be a CNN town hall flashes next. Among the clips are calls for tuition-free college, increased taxes, and an end to the Electoral College. Tea Party Patriots Action leader Jenny Beth Martin flashes on the screen explaining “two visions for America’s future,” in part as a choice between personal freedom and a system that chokes out personal freedom.